A settlement reached between Walt Disney World (NYSE: DIS) and a group of unions will give thousands of employees raises under a new contract. The unions represent 38,000 service employees at Walt Disney World, roughly 50 percent of the number working at the park. The raises are expected to bring an estimated $1 billion of additional wages into Central Florida’s economy over the next four years. The agreement increases the minimum starting pay for the covered workers to $15 an hour by 2021 through gradual minimum wage increases. According to the Service Trades Council Union, the minimum pay would be raised in $1 increments, reaching $13 an hour by September of next year, $14 in October 2020, and $15 in October 2021. Those who make more than $10 an hour will receive at least $4.75 in raises by October 2021. Most of the workers represented by the unions currently make less than $11 an hour. Under the settlement agreement, the covered employees will also receive $1,000 bonuses. Many Disney employees received the bonuses in January after Congress passed a tax cut, but the company announced that union members would not receive the bonus during pay raise negotiations. The deal also includes an offer to retroactively pay workers the greater of either an additional 50 cents an hour or 3 percent of their hourly wage for all hours worked since September of 2017. Disney said in a statement that the deal contains the “largest proposal ever offered by Walt Disney World Resort with significant pay raises.” The agreement still needs to pass a vote by union members. Members will vote on the new contract on Sept. 5 and 6. It is expected to easily pass. The settlement comes after nine months of tense wage negotiations between the company and the unions. 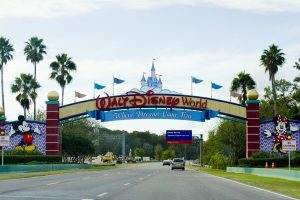 Many rallies took place during the contract talks, including one in October in which hundreds of union workers blocked traffic near a Disney World entrance.